"It's a Japanese El Camino!" he jokes from across the parking lot. Even Dominic Le doesn't take his project too seriously. After all, there's just something about his truck, dubbed the "Hakotora," that induces a smile with a sense admiration. Maybe it's Dominic's carefree character that has managed to rub off on his creation, or perhaps its a reaction based in astonishment itself: astonishment that such a creation can exist, and does so with unparalleled execution. 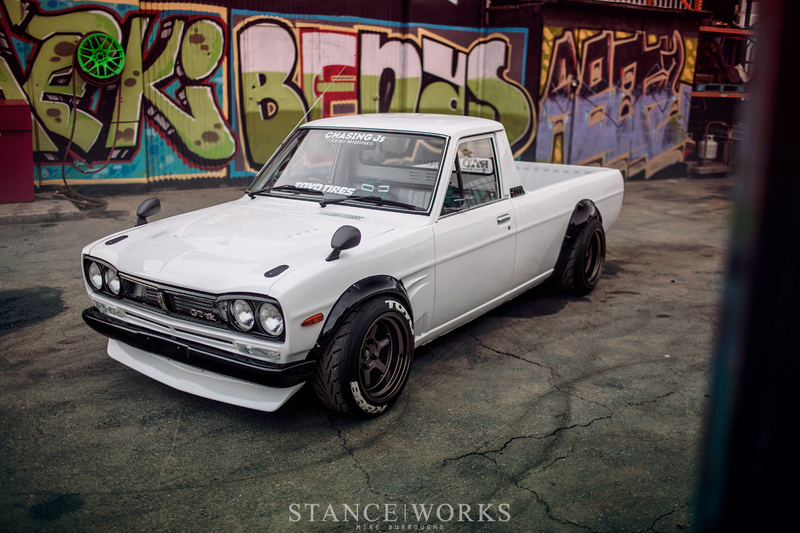 With the face of a Skyline, the body of a pickup, and the heart of a Silvia, it's almost surprising that such a juxtaposition works so well. For Dominic, it was an exercise in building the "ute" that could have been, and it's clear his vision worked. In fact, we're not alone in holding Dominic's creation in such high regard; since its debut at SEMA, the automotive press has been in a constant tizzy for the pint-sized pickup. Even Jay Leno himself has asked for a chance behind the wheel. 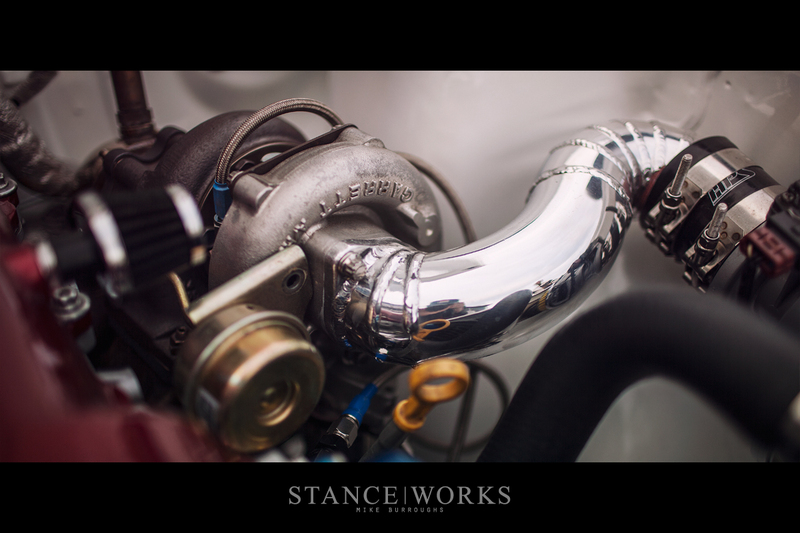 Luckily for us, Dominic has given StanceWorks the first look, and it should go without saying we like what we see. 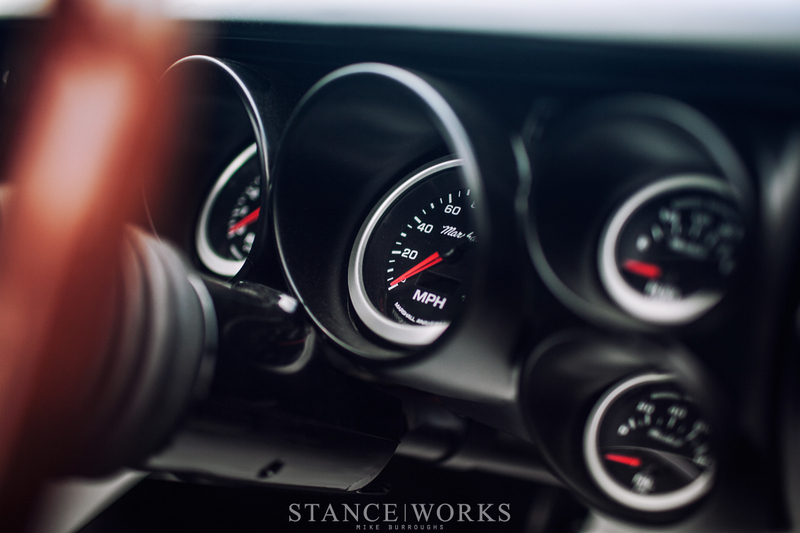 I've known Dominic Le for a couple of years now, and there's one thing about him I've learned above all else: his enthusiasm and passion for classic Datsuns is surpassed by few, if any. 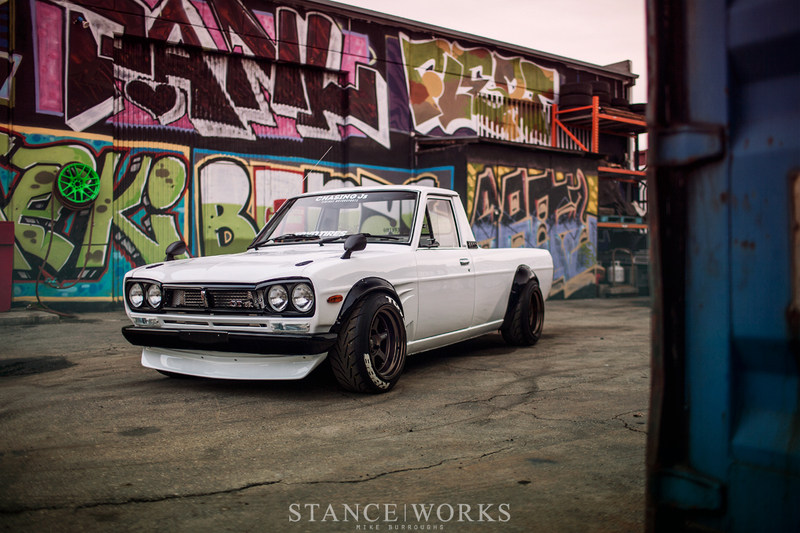 So much so, in fact, that this isn't his first Datsun on the StanceWorks Homepage. In September of 2014, a feature of his two-door 510 highlighted the roots of his excitement for the marque and his growing Datsun collection. 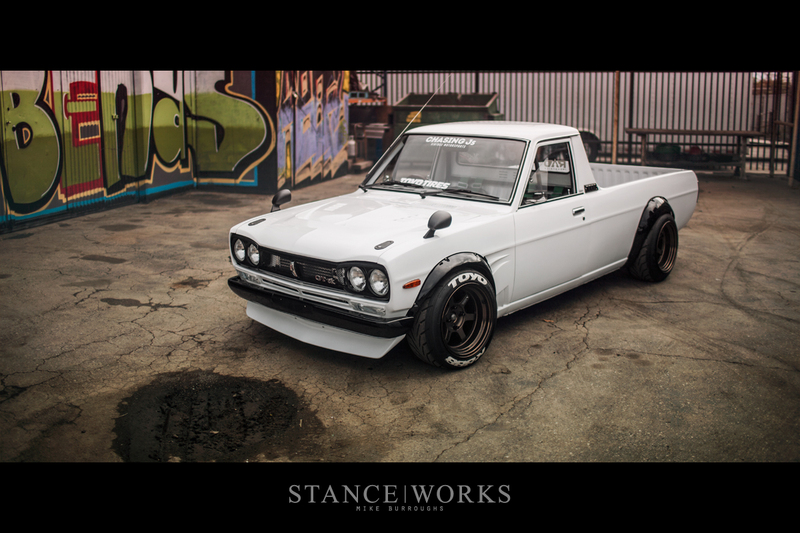 With three 510s to his name, he's been keen on moving to other Datsun models for quite some time. 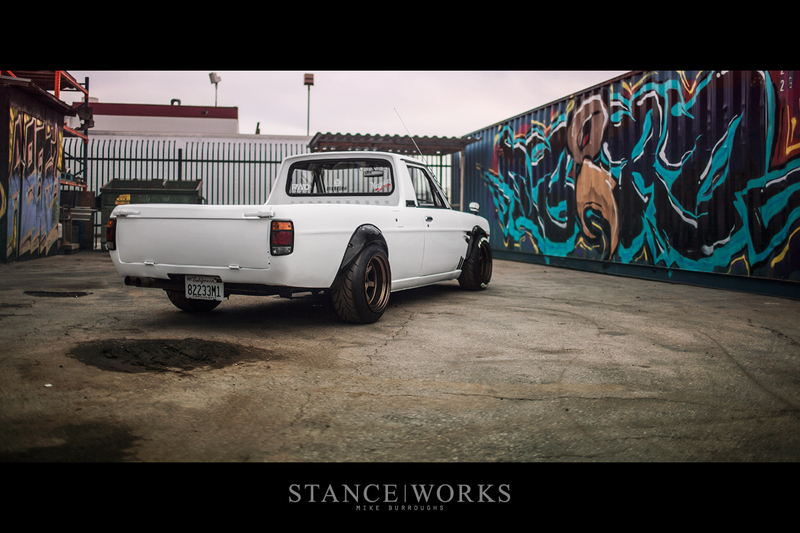 For years, Dominic has dreamt of building the one-off truck you see here, but its beginnings were far from straight-forward. The Datsun 510, despite its rarity, is at least available stateside. The Datsun Sunny Pickup, on the other hand, was relegated only to the Japanese market, making its acquisition a far greater challenge. 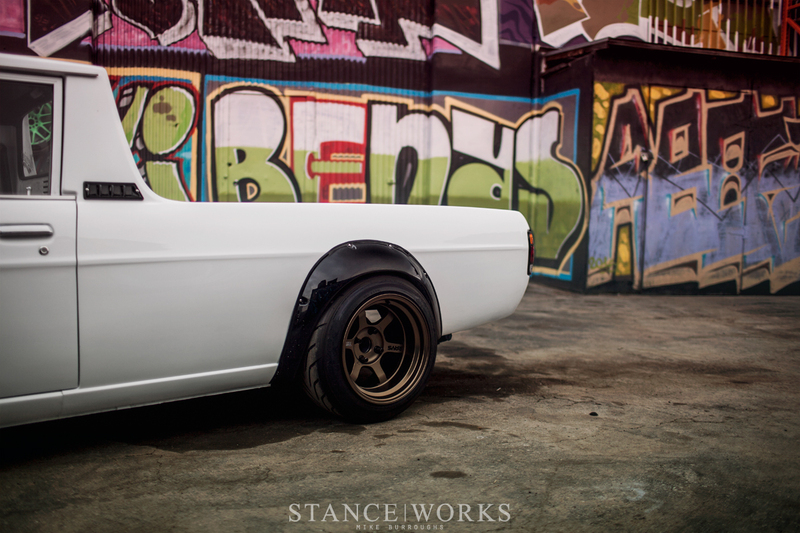 Dominic's Hakotora project began with a 1974 Datsun Sunny, imported from Japan sometime back in the mid 1980s. Three years ago, the truck was purchased by Dominic's friend, whom began the build himself. Unfortunately for him, the project began with a fizzle instead of a bang. For the better part of two years, the truck moved from shop to shop with no progress to show for it. The owner was given the run-around, with suggestions that his skyline-nosed truck build was simply too much work. Dominic had expressed an interest in purchasing the truck after making note of its lack of progress, but interest in selling the vehicle wasn't reciprocated. However, two months before SEMA, he received a phone call; the truck was for sale. With the build on his bucket list, he bought the truck, no questions asked, but then a very startling reality set in. Like many of us, Dominic knows the importance of SEMA and the stage it sets for the year's biggest project unveilings, and as the face behind Nuke Performance in North America, doubly so. If there was ever a stage set to unveil his dreamt-up rendition of a Japanese Ranchero, it was unquestionably SEMA in Las Vegas, Nevada. With two months until the show's start, that meant moving quickly. Very, very quickly. When the truck was delivered to Dominic, it arrived in pieces, perhaps a saving grace, knowing the car would need to be completely disassembled to attain the level of finish he desired. Having built several Datsuns in the past, he had a good idea of what needed to be done, and who to call for help. With haste, he called his "right hand man," John Esteban, the one man Dominic claims "is the only guy I knew who had the same passion for these cars as me." First and foremost for the build was the bodywork, and most notably, the front-end conversion. Sourced from 09 Racing in Japan, the Hakosuka front-end for the Datsun Sunny pickup is composed entirely of dry carbon fiber. The fenders, hood, and nose panel pieces make up the 09 Racing kit, while the lighting components themselves are genuine Skyline parts, purchased new from Japan. 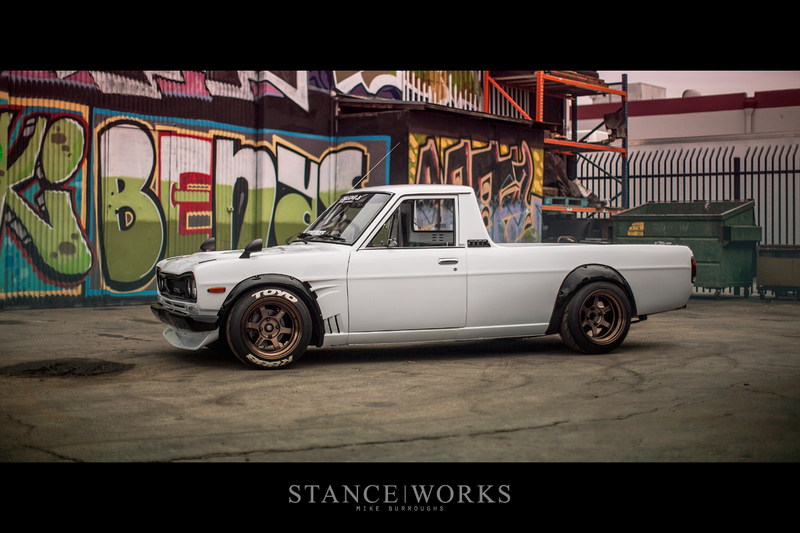 The carbon work continues throughout the truck, moving towards the back by way of dry carbon Hakosuka Skyline headlight covers, mirrors, and rear fender flares. Dominic went so far as to re-floor the truck bed in aluminum and carbon as well. Hidden underneath the glossy white paint, even the truck's tailgate is a carbon composite. 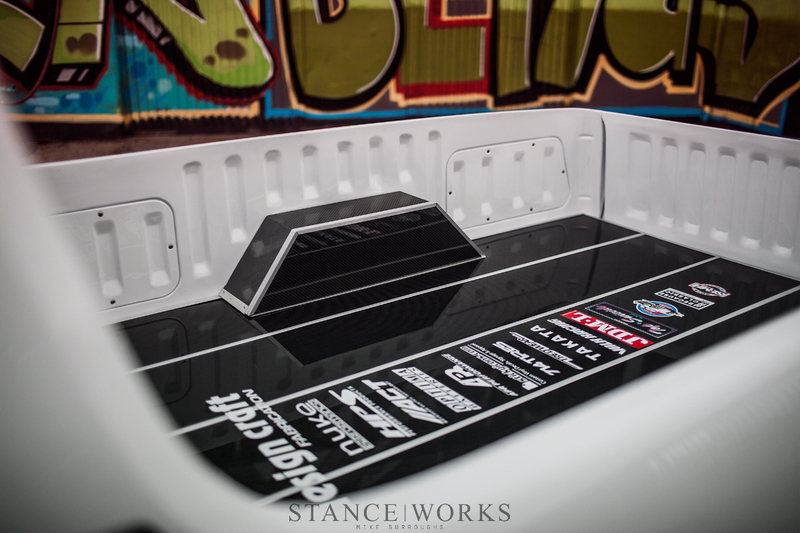 At the back of the truck, touches of custom work will undoubtedly go unnoticed by most. The bed's cargo hook rails and the rain tray were shaved entirely, smoothing the truck's profile lines to match the Skyline's sleeker aesthetic. Countless hours were spent straightening and smoothing the body in an effort to give the Datsun a level of "flow" it never possessed, even new. "Although this is a Frankenstein build, I didn’t want it to look like one. I wanted clean lines so that everything would look like it was made originally from Nissan," Dominic claims. For suspension, Dominic aimed for continuity. Under the carbon fiber bed of the truck is a set of original NISMO leaf springs - an item we'd never have guessed existed. The frame itself was C-notched to allow better suspension travel, and a NISMO LSD gives the truck its squirly attitude. For the front suspension, custom Chasing Js coilovers, camber plates, tie rods, and control arms were all fitted, allowing for infinite adjustability and a solid quality ride. Affixed to the struts are Wilwood disc brakes, and attached to the hubs is a set of 15x9.5" and 15x11" Volk TE37Vs, wrapped in Toyo R888s. Inside the car, the details continue. 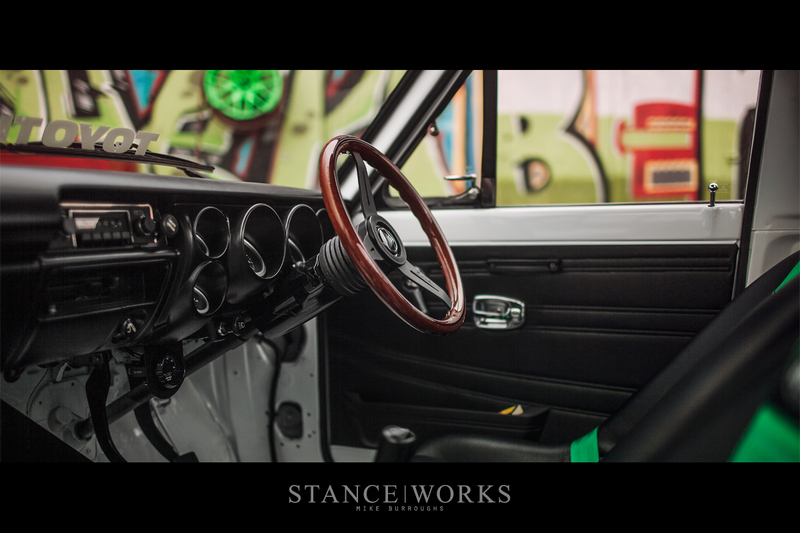 A custom Hakosuka Skyline dashboard and center console were fitted to the truck, complete with marshall gauges and a Nardi wheel. 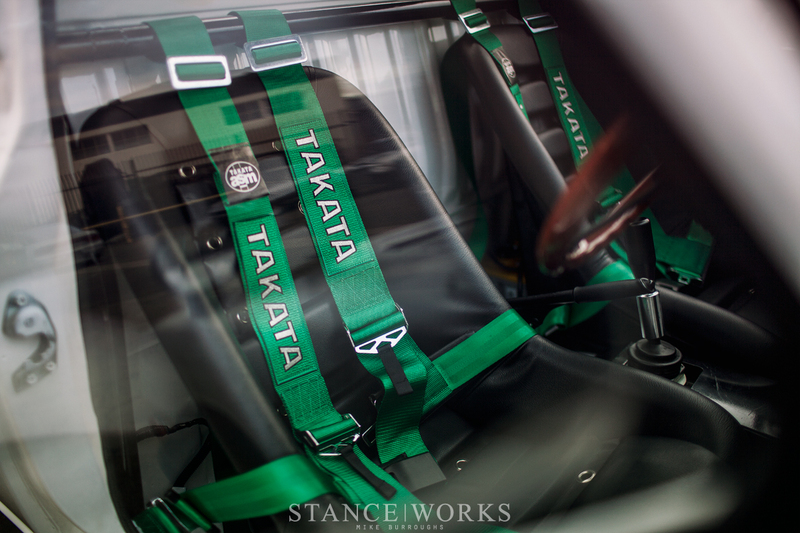 Dominic finds himself seated in a set of Autolook lowback race bucket seats, and wrapped in Takata harnesses, affixed to a DesignCraft harness bar. 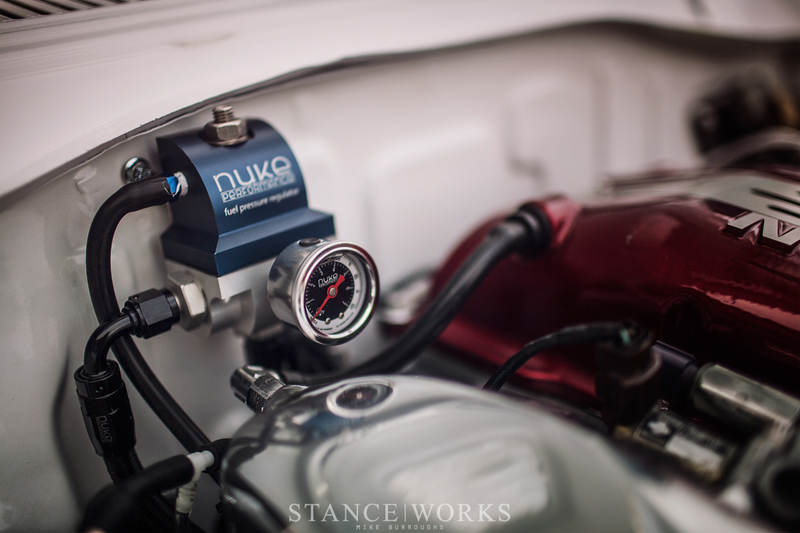 Although the interior is cramped, it affords Dominic just enough room to wrangle the SR20DET mounted under the hood. The engine bay is just as well crafted as the car's exterior, with an S14-sourced SR turbo 4-cylinder acting as the centerpiece. Inside, forged H-beam connecting rods and a forged crank hold up to the power, while Tomei cams, rocker stoppers, titanium valves, and a slew of Greddy parts help to get things flowing. Of course, a few Nuke parts, such as the blow off valve and fuel pressure regulator, are present too. An ACT 6-puck clutch and lightweight flywheel send the power to the driveshaft, and the end result is a truck that is both enjoyable to drive and frightfully fast. Tipping the scales at just 1800lbs, and with 450 horsepower on tap, Dominic's Hakotora is more than a hand full, and Dominic suggests that while the power to weight ratio is one of the truck's strongest points, its also perhaps its weakest. "Since the rear end is so light, all the power of the truck can't be fully put to the ground." Hardly a downside, if you ask me. 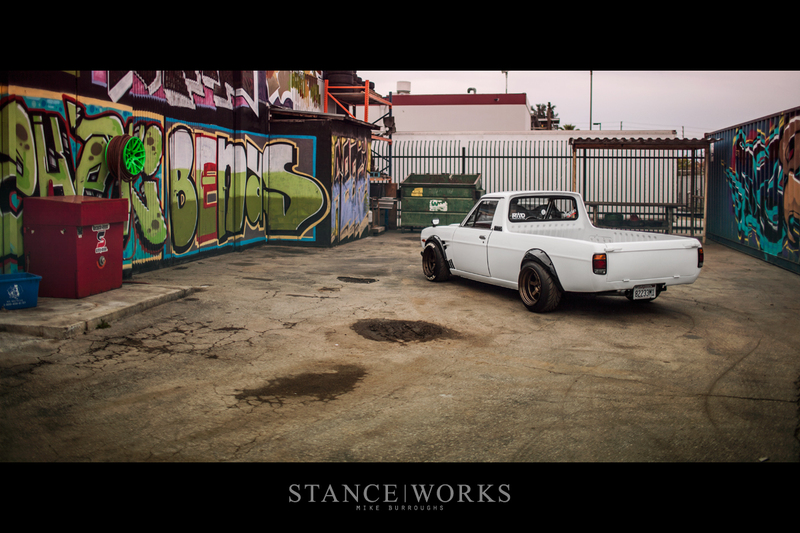 If anything, it simply means Dominic Le has built a truck that looks phenomenal and has the performance to match. 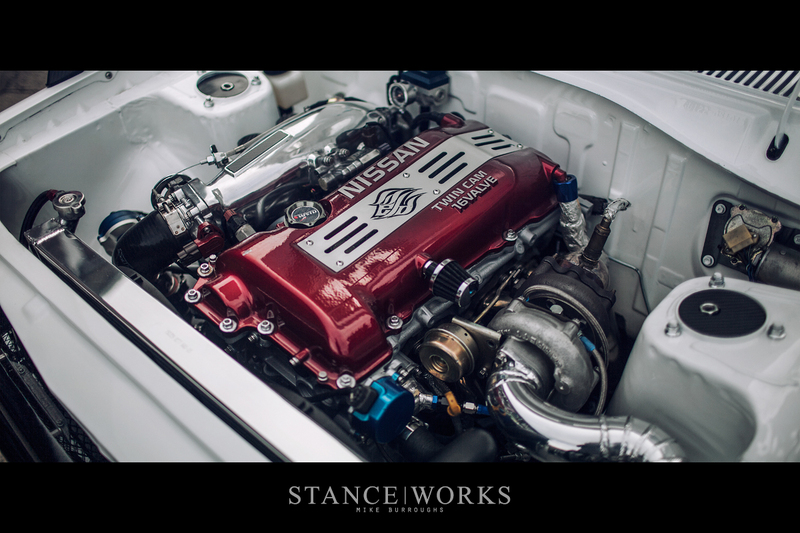 Dominic tells me "I wanted to keep it all Nissan, but the little details of this build are what really made it fun. From the custom Skyline Dash, to all the OEM Skyline lights, I wanted to build a car to reflect my love for this culture and to showcase my interpretation of what a Nissan Skyline GTR truck straight from the Nissan race factory might look like." The Hakotora's reception serves as a standing ovation to the message he has concisely delivered. And somehow, Dominic still finds himself taken aback by the truck's reception. "It was one of those builds that you just don't really know how people will react. I usually just build what I like, but its an honor to have people enjoy the build as much as I enjoyed building it." From where we're standing, it's an honor just to share it, Dom. Now, with 10 months to go, we're anxious to see what you do for SEMA '16. A special thanks to Dan and RAD Industries for use of their shop for our photo shoot! Is the car for sale? Love it! I first saw one of these utes in Japan 3 years ago a thought the kit worked perfectly. The GTR badge however is a fail IMO….it’s the same as putting an M3 badge on your 318i. Also, these are JDM exclusive, they were very available for 15 years+ in Australia and sold as a Datsun 1200 ute. Are there any high-res photos? I would love to have that as my wallpaper! Can’t discribe how much i love it! Eddie van Rensburg This car is one of a kind. Its not your average 1400 champ mahbru.